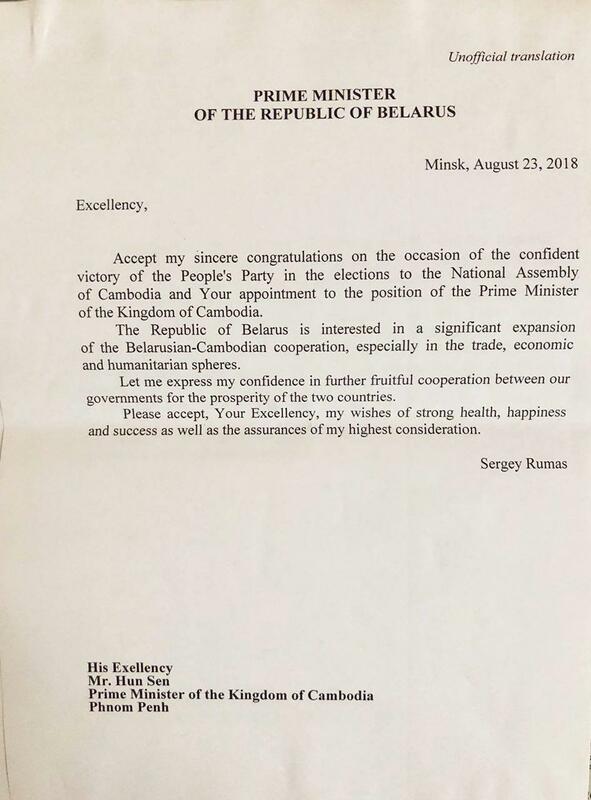 Phnom Penh (FN), August 28 - Prime Minister of the Republic of Belarus Sergey Rumas congratulated Cambodian People's Party (CPP) over the victory of general election 2018, according to the letter addressed to Cambodian Prime Minister Hun Sen dated on 23 August 2018. “The Republic of Belarus is interested in a significant expansion of the Belarusian-Cambodian cooperation, especially in the trade, economic and humanitarian of Cambodia,” Sergey added. In the official results of July's elections, the National Election Committee said that the CPP received 4,889,113 votes of the total 6,362,241 valid votes, taking all the 125 seats in the National Assembly.